We’d love your help. 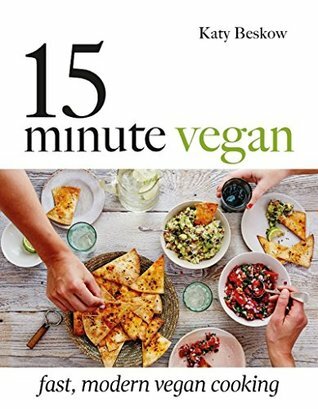 Let us know what’s wrong with this preview of 15-Minute Vegan by Katy Beskow. To ask other readers questions about 15-Minute Vegan, please sign up. 4.5? It’s a little hard to rate a cookbook, there’s not much of a plot or characters to get invested in. I will say this seems like a quality book. The pictures are nice and the pages are thick and heavy. It has a bit of an introduction and helpful tip section that I usually wouldn’t bother to read in a cookbook but felt like I had to if I wanted to say I read the book. Each recipe had a little blurb, perhaps similar to the style she uses in her blog, that gave me something to read beyond a list 4.5? It’s a little hard to rate a cookbook, there’s not much of a plot or characters to get invested in. I will say this seems like a quality book. The pictures are nice and the pages are thick and heavy. It has a bit of an introduction and helpful tip section that I usually wouldn’t bother to read in a cookbook but felt like I had to if I wanted to say I read the book. Each recipe had a little blurb, perhaps similar to the style she uses in her blog, that gave me something to read beyond a list of ingredients and instructions and was never long enough to drag. I was diagnosed with egg, milk, and soy allergies last year. Cutting out all that stuff led me to a crisis: what the heck can I eat??? Everywhere I looked it was soy in this, egg in that, milk in both. For no reason! So one day I realized hey wait, vegans don't eat milk or egg, and it should be easy to avoid tofu (soybeans)! Well sure, but also...wait for it...I'm picky and don't like pastas. I don't like vegan cheese, and I don't like coconut! That being said, I found this book at the library. T I was diagnosed with egg, milk, and soy allergies last year. Cutting out all that stuff led me to a crisis: what the heck can I eat??? Everywhere I looked it was soy in this, egg in that, milk in both. For no reason! So one day I realized hey wait, vegans don't eat milk or egg, and it should be easy to avoid tofu (soybeans)! Well sure, but also...wait for it...I'm picky and don't like pastas. I don't like vegan cheese, and I don't like coconut! That being said, I found this book at the library. There's a lot in here I want to try. I'm a terrible cook who has to look up how to chop things (finely chopped?? roughly chopped? Do i take it out back and beat it up then chop it??) but a lot of it requires specialised equipment I don't have room for or things I don't care to buy to make one thing. But it is easy to read, easy to follow (basic instructions) and doesn't include things like foaming beans to make an egg substitute (yes, it's a thing). Thank goodness for that. I never rate a cookbook until I’ve actually cooked a few of the recipes. So I am here to attest that these are not quite doable in 15 minutes, at least by someone at my skill level. The book is nicely laid out, with an uncluttered design that’s easy on the eyes. Measurements are given three ways, two by weight and one by volume, for American cooks. I found most of the ingredients were fairly common and I didn’t have to make special trips to the store (once I laid in some coconut milk, at any rat I never rate a cookbook until I’ve actually cooked a few of the recipes. So I am here to attest that these are not quite doable in 15 minutes, at least by someone at my skill level. I made the sweet corn chowder and a cauliflower curry in about 30 minutes each. A mushroom and cherry tomato starter really was done in 15 minutes. There are only a few recipes I will try, which is mostly desserts or snacks. I hope the snacks without dairy products will work since my past ones were disastrous. I plan to try the vanilla rice pudding with another coconut rice pudding recipe (from online). The Japanese miso recipe, with the veggies I have available and already got the miso ginger broth from Trader's Joe, and shinake (sp) noodles from Safeway (organic/vegan area of the store on Madison/Dewey). The peanut butter oats bars. I hope There are only a few recipes I will try, which is mostly desserts or snacks. I hope the snacks without dairy products will work since my past ones were disastrous. I hope it all turns out well. 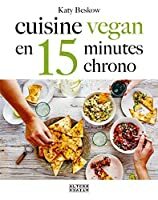 I like that you can complete it in 15 minutes since most vegan recipes I have tried in the past, preparation takes 30-60 minutes to do and then bake or cook another 15-30 minutes depending on recipe, and few minutes sometimes to cool. I tend to take longer to prep and cook these type(s) of meals. First, this is a beautiful looking book. Thick cover and pages, beautiful color photography and a judiciously chosen font. Every recipe I have tried has been quick and easy without a lot of odd or hard to find ingredients. Most recipes serve two (which seems to be a rare recipe book feature) making this great for singles and couples who don't want to spend a ton of time in the kitchen. I dropped a star from the rating because this book doesn't remotely lie flat which is a rather critical feature First, this is a beautiful looking book. Thick cover and pages, beautiful color photography and a judiciously chosen font. I dropped a star from the rating because this book doesn't remotely lie flat which is a rather critical feature when trying to follow a recipe in it. I use binder clips when cooking to keep the pages open. I am a 75% Vegan. And could be more but I get lazy and go for the easy cooking. When I saw this title I thought "GREAT" and it mostly is. I have tried 3 receipes and have 5 more on my "wish" pile. While some took a little more than 15 - they have all been less than 30. Maybe I chop slower or my stove cooks slower but they were easy and more importantly tastey! 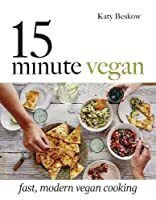 15 Minute Vegan has easy recipes, that are quick, include ingredients that I usually buy, and they taste good. I didn’t believe in a 15 minute vegan, microwaved cookie, but this book proved me wrong. Just enough for me, no leftovers to tempt over eating, yet easy enough to make more instantly. Great inspiration for simple recipes in this book. This book is fantastic. I picked it up to find meal ideas without meat and diary, which I am drastically reducing in an effort to lower my cholesterol and lose weight. The recipes are unique, yummy and pretty easy to make. As a non-vegan I can't comment on how it compares to other vegan cookbooks but I am really pleased. Also, I love the size. It fits easily in a drawer. I buy recipe books largely for inspiration, and there are some tasty ideas in this accessible book, which uses commonly-found ingredients and European measurements. Will definitely try some of these out, although I suspect they'll take me longer to prep than 15 mins..! Surprisingly good recipes, great for a beginner. Very clear instructions, sparse text on the page. Wish pics would’ve been full page. I'm new to being vegan and this book is absolutely fantastic! The recipes are delicious and straightforward. I would recommend this book to everyone, not just vegans. There were only two recipes I want to try, so this one wasn't very successful for me. Simple, quick vegan recipes, good formatting and photos, would check out again. Another must have cookbook! The 15 minute part is a lie. Prep takes more than 15 minutes. Once you have the prep complete, these take 15 to 20 minutes to cook. You had me at 15 minutes and crispy potato rosti! EXCELLENT. Katy Beskow is the author of best- selling cookbook 15 Minute Vegan and new book 15 Minute Vegan Comfort Food-out now! Katy is an award-winning cook, writer and cookery tutor with a passion for fuss-free home cooking. Once inspired by a bustling and colourful fruit market in South London, she now lives in rural Yorkshire and cooks from a small (yet perfectly functioning) kitchen.